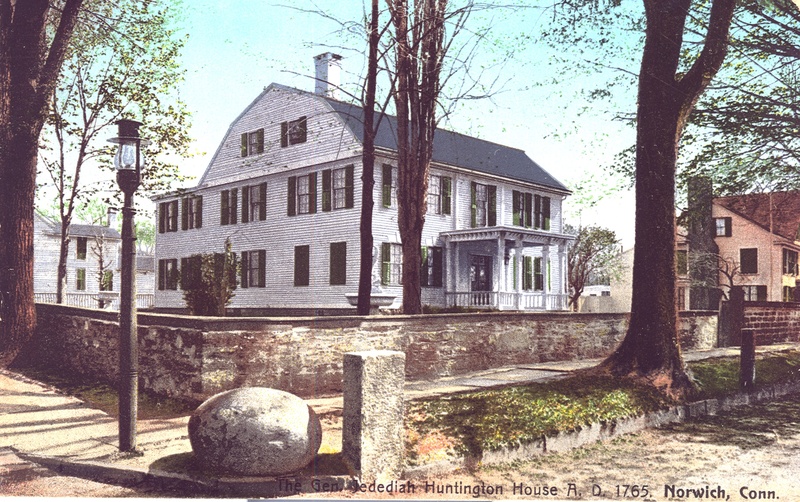 Jedediah Huntington was born in 1743 the son of General Jabez Huntington. He graduated from Harvard in 1763 and was appointed Colonel of Connecticut’s 8th regiment. He received the rank of Major General upon the war’s conclusion. He participated in many battles including the siege of Boston in 1775, the Battle of Bunker Hill, the Battle of Ridgefield and endured the hardships of Valley Forge. He married and had one son with Faith Trumbull, daughter of Connecticut’s Revolutionary War Governor Jonathan Trumbull and sister of painter John Trumbull. Faith witnessed the gruesome Battle of Bunker Hill and the fear of losing her family members to the brutality of war caused her to take her own life. In 1778, Jedediah married Ann Moore and the couple had several children. Jedediah hosted his father-in-law, Governor John Trumbull, and General George Washington for dinner when General Washington passed through Norwich in April of 1776. Jedediah was a member of the court martial of General Charles Lee and sat on the Court of Enquiry at the trial of British Major John Andre who conspired with Major General Benedict Arnold to betray West Point to the British. After the Revolutionary War, Jedediah moved to New London and became the Collector of Customs until his death in 1818. His remains are interred in the Huntington family tomb in Norwich. This is one of the most imposing 18th century houses in Norwich; a fine two and half story, gambrel roofed, twin chimney, center hall style.